Art @ Work, the five-week mural artist apprenticeship program for Baltimore City youth enrolled in the city’s Youthworks Baltimore program, employs young people ages 14-21 to work under lead teaching artists to create highly visible community artworks throughout their neighborhood. 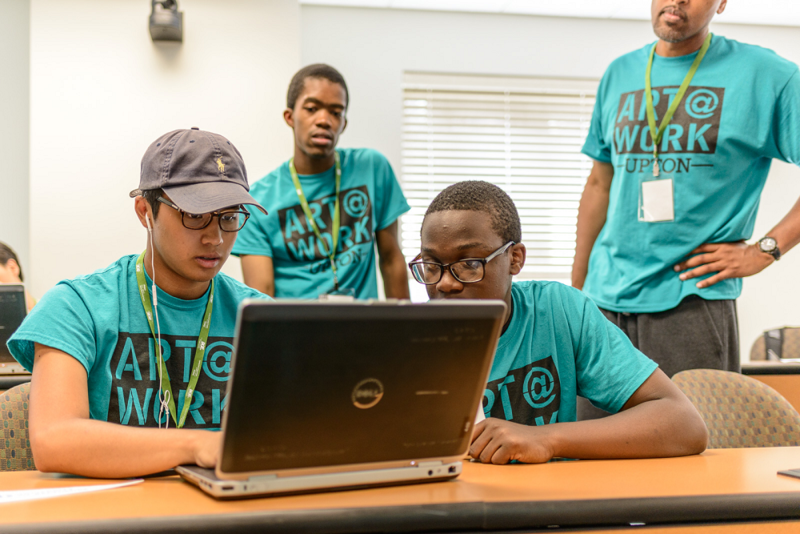 Additionally, Art@Work introduces youth to career opportunities in the arts, offers gainful employment in a positive learning environment and provides youth with the tools to express themselves through the arts, all while beautifying their community. Lead teaching artists for Art@Work 2018 are: Dalvin Byron, Megan Lewis, LaToya Peoples, Iandry Randriamandroso, S. Rasheem and Ernest Shaw. Art @ Work is produced by the Baltimore Office of Promotion & The Arts, Jubilee Arts, Druid Heights Community Development Corporation and Park Heights Renaissance and made possible through a partnership with Youthworks Baltimore. The Baltimore Office of Promotion & The Arts is a 501 (c)(3) non-profit organization which serves as Baltimore City’s arts council, film office, and events agency. By producing large-scale events such as Light City, Artscape and the Baltimore Book Festival, and providing funding and support to artists, arts programs and organizations across the city, BOPA’s goal is to make Baltimore a more vibrant and creative city. 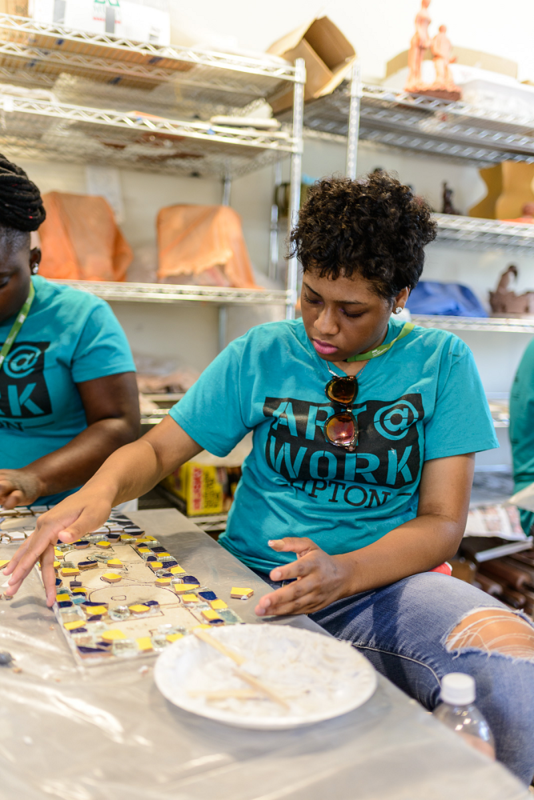 Jubilee Arts is a community-based arts program offering visual arts, dance, ceramics and business in partnership with Baltimore Clayworks, Maryland Institute College of Art (MICA), the Baltimore Office of Promotion & The Arts (BOPA), area artists, writers and dancers. 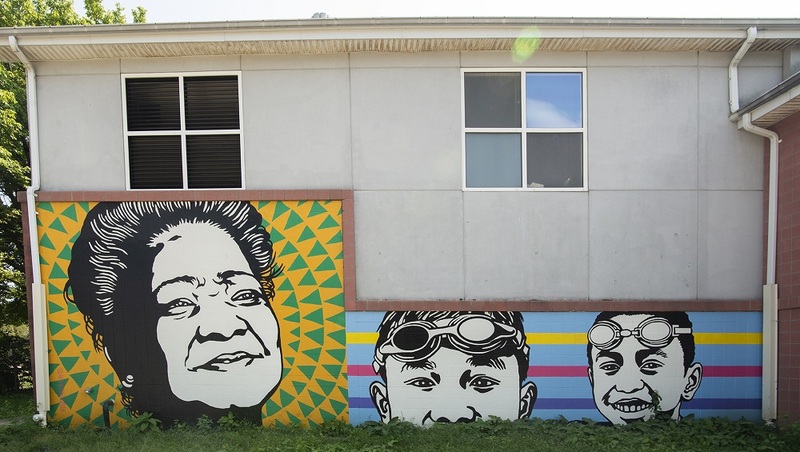 Jubilee Arts is a catalyst for social change, using art as a tool for empowerment, community building, learning our history and changing our future. The Druid Heights Community Development Corporation (DHCDC), a non-profit organization, was established in 1974. DHCDC is governed by a 18-member Board of Directors that include political, corporate, and community representation. Its mission is to promote and encourage areas of community development and empowerment through numerous initiatives. 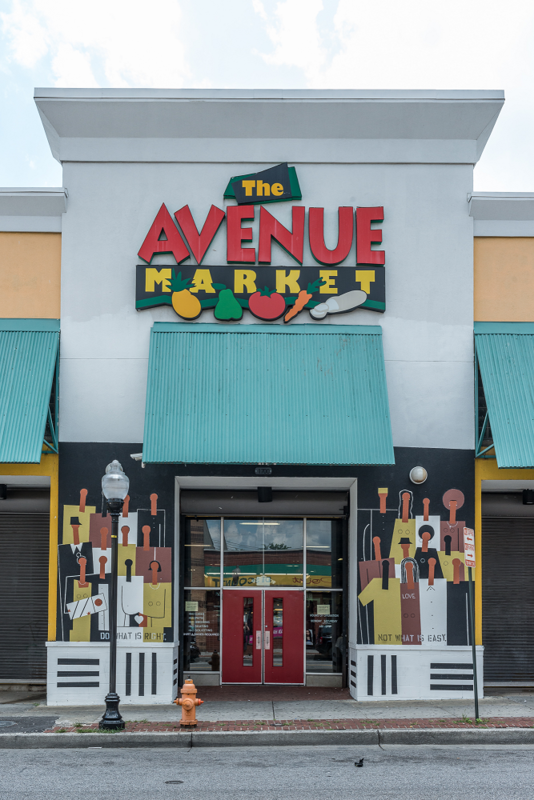 The overall goal is to accelerate the revitalization of the neighborhood with self-empowerment, employment and economic opportunities all while creating a stable and safe community environment. Park Heights Renaissance is a non-profit 501(c)(3) organization representing businesses, religious institutions, schools, agencies, and other stakeholders committed to shaping a better future for Park Heights. The geographic footprint of PHR is 1,500 acres — almost twice the size of Central Park in New York — comprising a diverse group of more than a dozen neighborhoods. 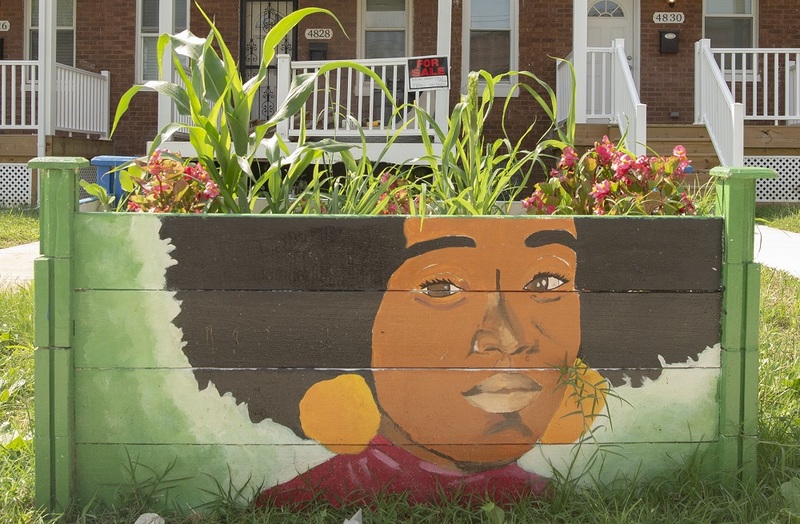 The mission of Park Heights Renaissance (PHR) is to help implement the Baltimore City Park Heights Master Plan, drive land and economic development, and partner with human development organizations that are transformative influences in the revival of a thriving and sustainable community. In 2017, the Art @ Work program was located in both the Waverly and Reservoir Hill and created 85 youth jobs, employed 16 professional artists and artist assistants, engaging over 40 local, state, and national partners, and generating eight new public artworks. 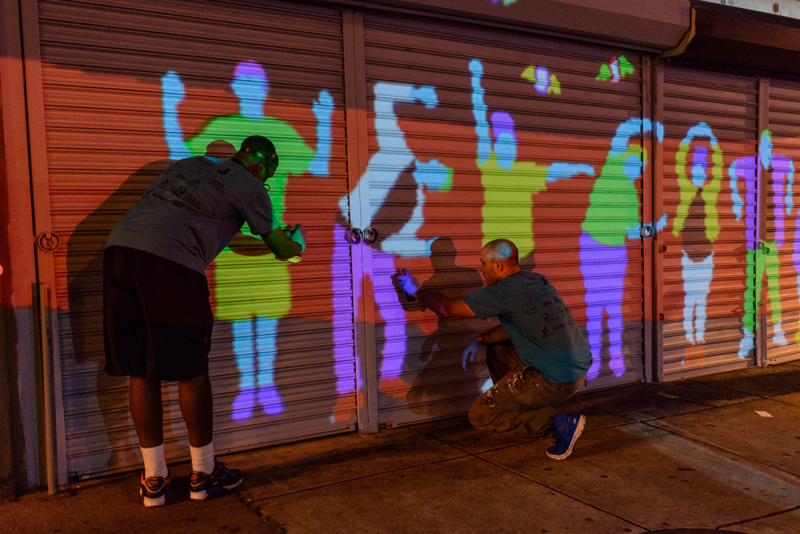 Eight professional teaching artists were hired to lead teams of eleven youth workers through the entire process of conceiving, designing, and creating a public art project within their community. 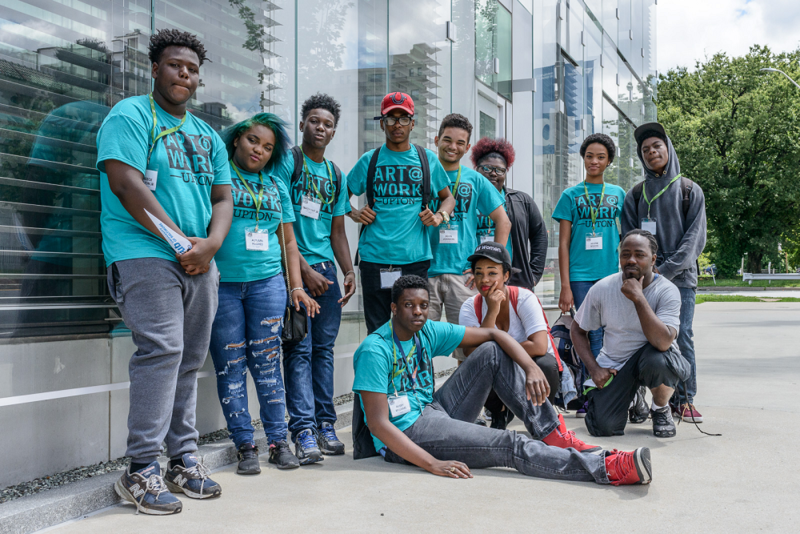 The youth participants worked alongside professional artists Julie Anne Horton, Latoya Peoples, Megan Lewis, S. Rasheem, Gary A Mullen, Iandry Randriamandroso, Ernest Shaw Jr., and Michael A Thomas Sr. 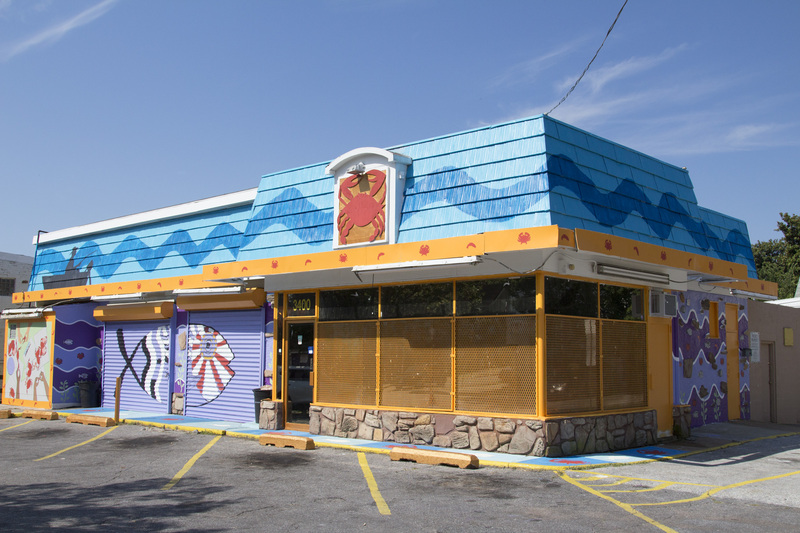 This mural is designed to support an important and thriving business in Waverly, the mural features colorful, eye-catching images of crabs, fish and shrimp, all sold at the Waverly Crab House. While gathering information from the community, residents talked about the past, present, and future of Waverly. Community members commented about witnessing change, but wanted to see more. The artists determined that in order to see change you must evolve. In order to evolve, you must learn and grow. A Black woman is depicted as the narrator that represents the comforter and healer. She is leading the way, as she carries the culture of her community and wears it proudly. Follow her lead and evolve. 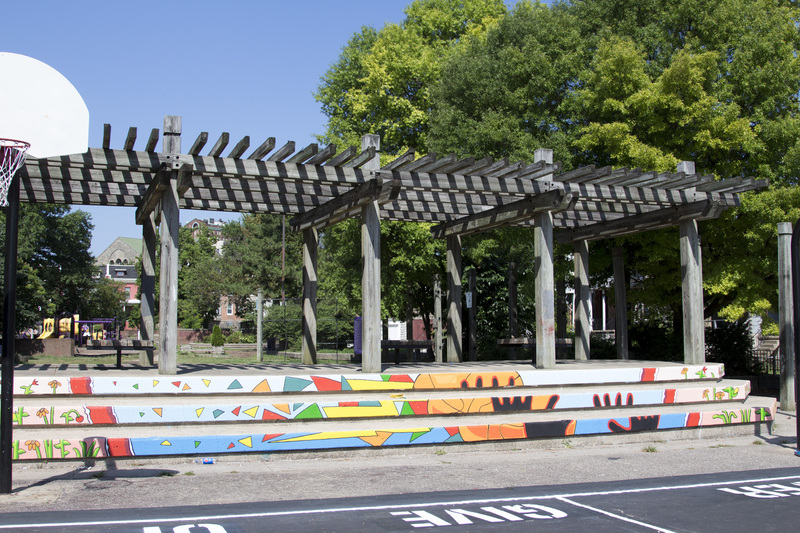 The mural depicts a youth in deep contemplation about the Waverly neighborhood. His thoughts are represented by colorful shapes, where scenes of Waverly through time are superimposed. The mural shows some of the rich history of Old Victorian Waverly on the left, a transition through to the present, and a road leading to a bright future! 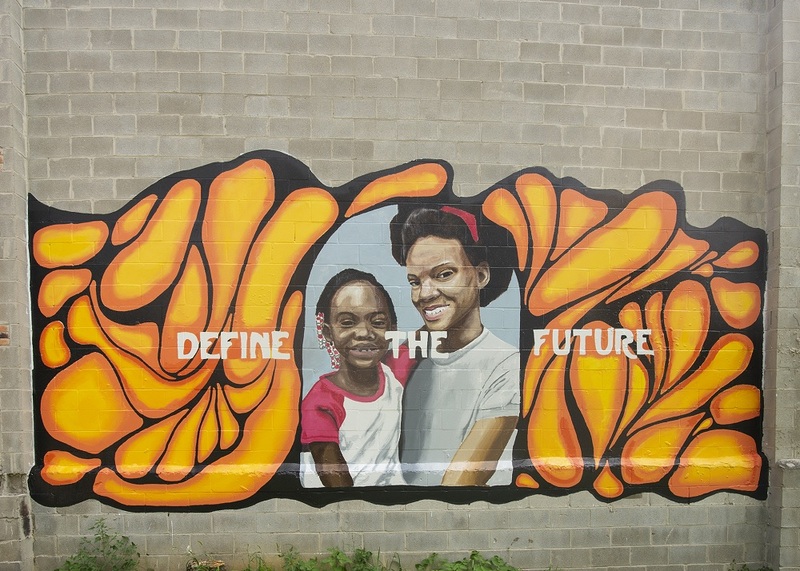 This mural represents the many sentiments expressed from local residents during community interviews. The artists also wanted to promote The Book Thing of Baltimore, an organization that allows people to receive free books to further their knowledge and education. 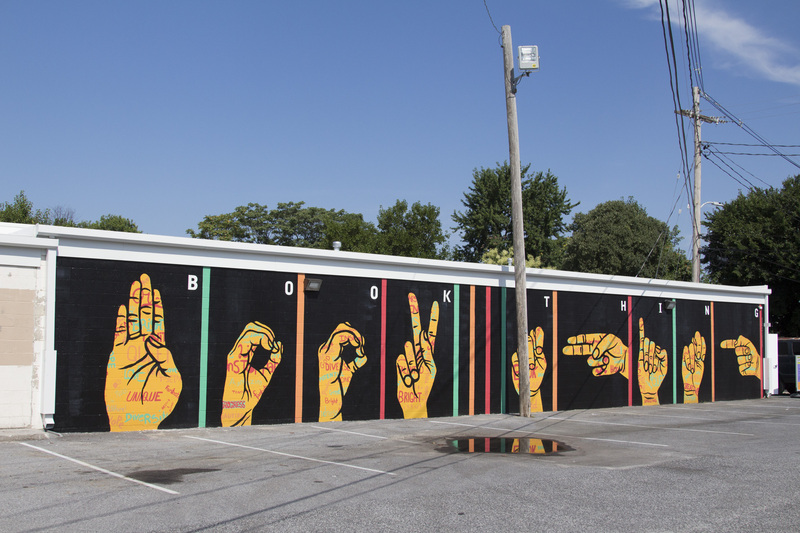 In the design, they used letters from the American Sign Language alphabet to spell out the words “BOOK THING” and utilized the palms of the hands as a vehicle to share key themes from their community conversations with mural viewers. 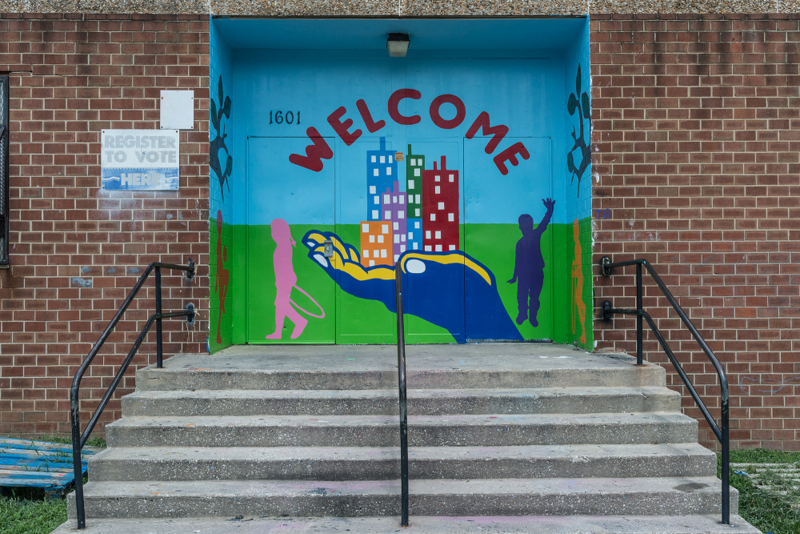 For the past 60 years, Cloverdale Recreation Center has served as a staple of support in West Baltimore for ages 7-75. 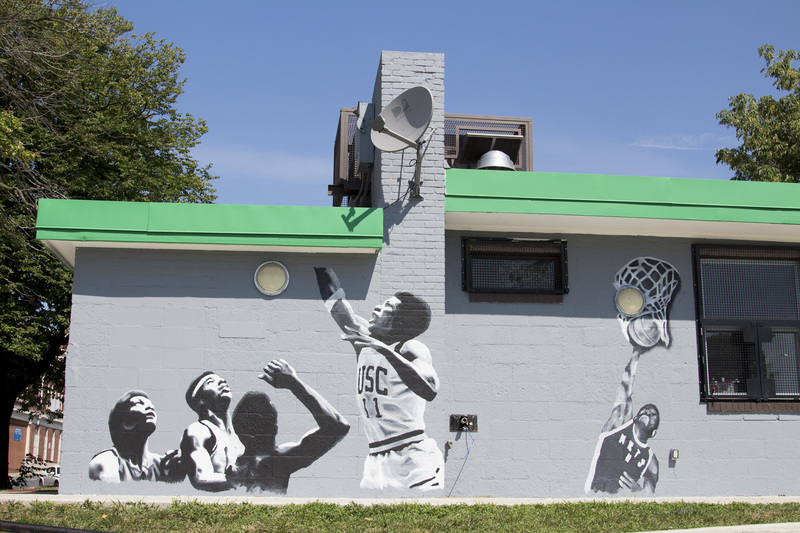 Ernest’s team wishes to create a mural that expresses the joy that the game of basketball can bring to a community. 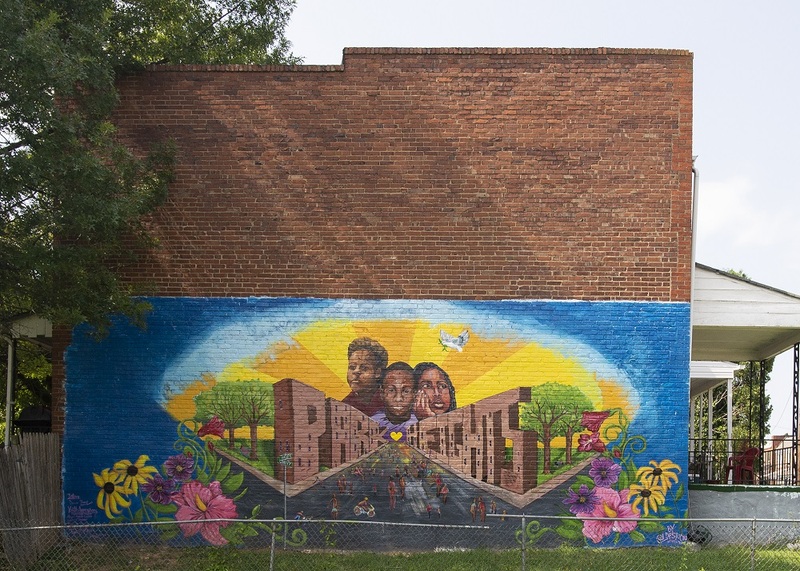 The Break Through mural is inspired by the sentiments of many Reservoir Hill neighbors. It depicts symbols of youth, potential, inspiration, hope, love, and growth. At certain points of the mural, the design shows a crack and breaks open - only to reveal more beauty beyond the layer. Like a tree that grows from a vacant building, the greenery that surrounds our mural is an ode to the ideas of good, life, and new growth. Nature, like love, always finds a way. 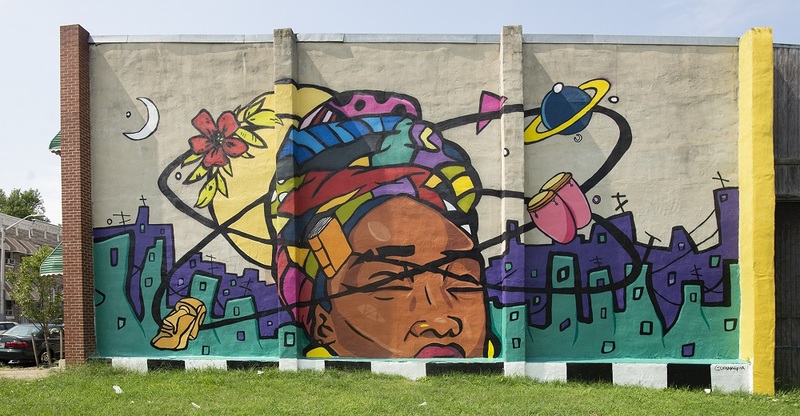 The mural depicts a combination of African American culture, sci-fi, fantasy, and mysticism that reimagines Black artists in the future. It celebrates artists as creators, keepers, and innovators of culture. 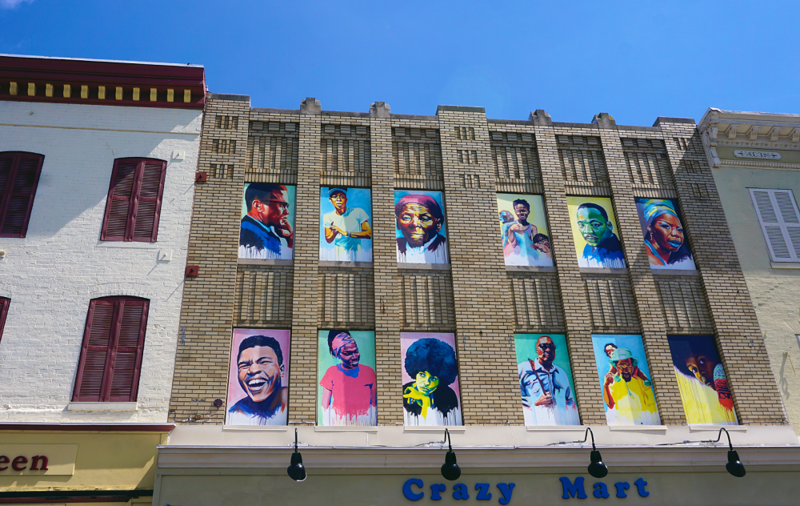 The mural depicts the beautiful community of Reservoir Hill in the early days. The artist came up with the design using input from the community and the building owners. History, music, and the image of an old car were used to help communicate the different uses of the Tune Up City building. 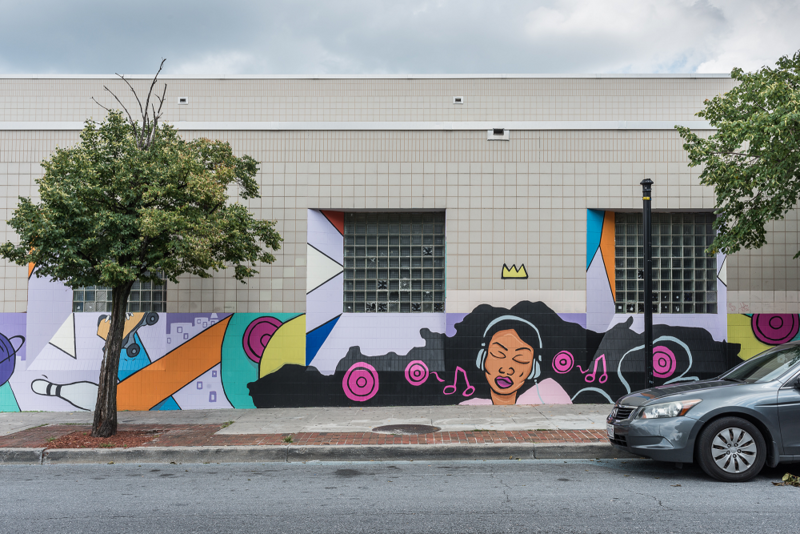 Art @ Work, the five-week mural artist apprenticeship program for Baltimore City youth enrolled in YouthWorks, returned for a second summer in 2016 with Art @ Work: Upton. 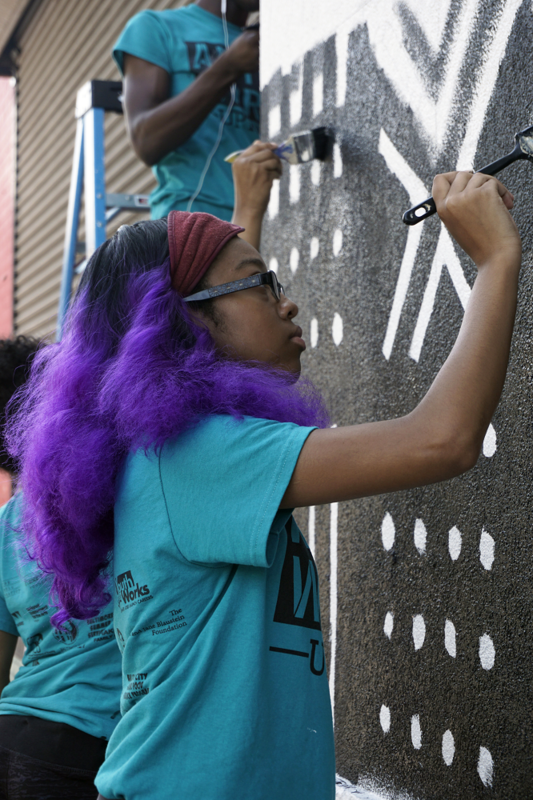 In addition to working alongside professional artists to create murals and mosaics in their community, youth from the Upton area participated in professional development and skill-building workshops led by various local organizations. 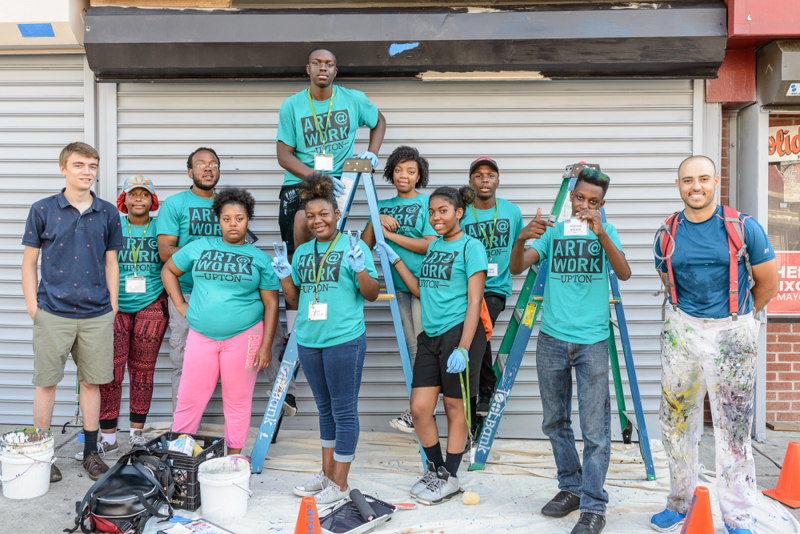 Launched as a pilot program in Summer 2015 through a partnership between the Baltimore Office of Promotion & The Arts and Jubilee Arts, Art @ Work employed dozens of youth from the Sandtown-Winchester neighborhood in its inaugural year. 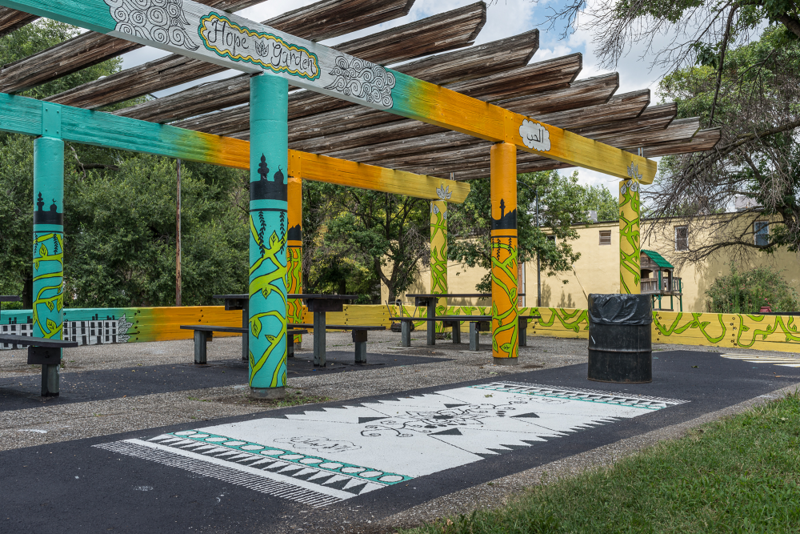 Eight teams comprised of a lead artist, an artist intern, and ten youth apprentices created public art projects along the Pennsylvania Avenue cultural corridor at sites including the Shake & Bake Family Fun Center, The Avenue Market, Sissy’s Seafood, Lafayette Market, Crazy Beauty Mart, Etting & Wilson Park, Eutaw Marshburn Elementary School and the 1900 block of Division street. The lead artists are Julie Horton, Ignacio Mariño Larrique, Megan Lewis, Herb Massie, Gary Mullen, Iandry Randriamandroso, Ernest Shaw, Jr. and Mike Thomas. 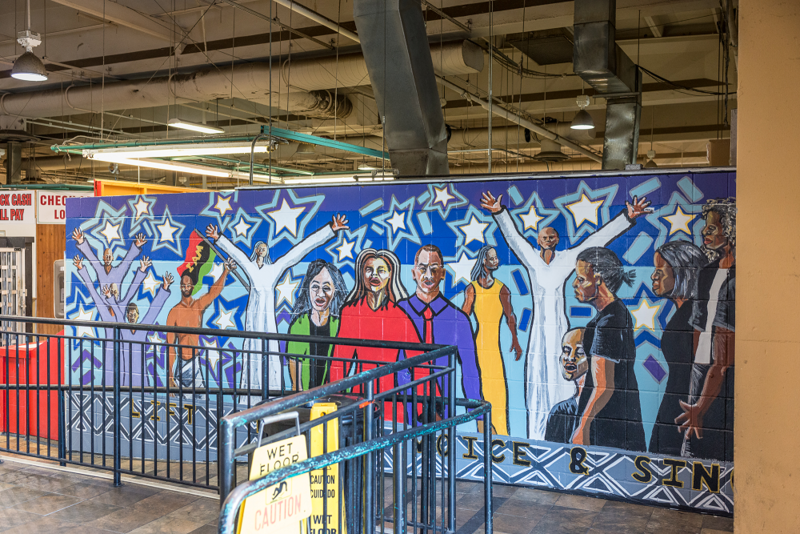 Each team led the entire mural making process, from canvassing community residents for design inspiration, to public design presentations, to conducting trolley tours of their finished projects. Beyond the paint and tile, each youth apprentice also participated in financial literacy workshops led by the Baltimore CASH Campaign, professional development workshops led by HIBRED Workforce Solutions, leadership development workshops led by the No Boundaries Coalition, Youth As Resources and BUILD, as well as zine-making workshops led by local pop-culture journalist Jordannah Elizabeth. Art @ Work: Upton is produced in partnership by the Baltimore Office of Promotion & The Arts and Jubilee Arts and made possible through the generous support of The Abell Foundation, France-Merrick Foundation, Youth Works, National Endowment for the Arts Art Works, Morton K and Jane Blaustein Foundation, Maryland Department of Commerce, Maryland Department of Housing & Community Development, Baltimore Department of Housing & Community Development, Baltimore City Summer Food Service Program, Baltimore City Recreation & Parks, University of Baltimore, Avenue Market, Shake & Bake Family Fun Center, and Charlestown Retirement Community. For more information on Art @ Work: Upton, visit: jubileeartsbaltimore.org, view the Art @ Work: Upton Final Report or call the Baltimore Office of Promotion & The Arts at 410-752-8632 or Jubilee Arts at 410-728-1199. Artist Ernest Shaw, Jr. was born and has lived most of his life in Baltimore, Maryland. Shaw comes from a family of visual and performing artists. He received his Bachelor of Arts degree from Morgan State University and his Master of Fine Arts degree from Howard University. 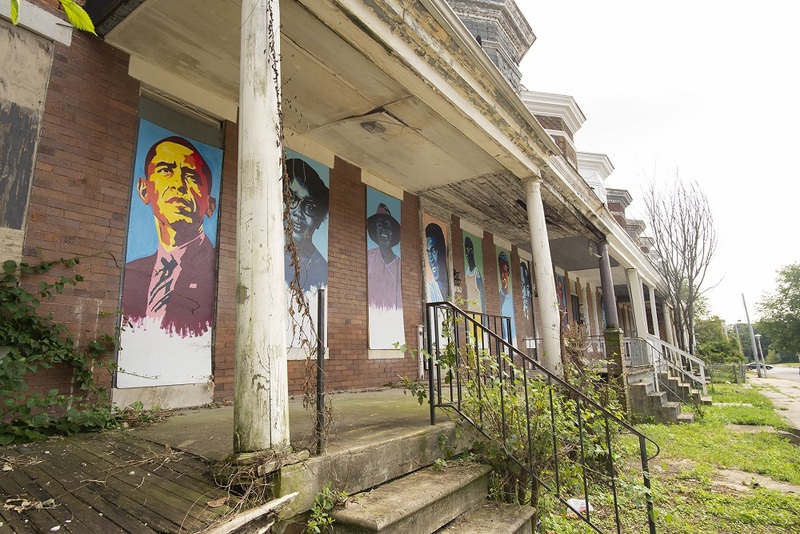 He has previously painted murals for Open Walls Baltimore II and the Baltimore Mural Program. Gary Mullen is an award-winning artist who received a degree in graphic design from Morgan State University. He has studied the genius works of Pablo Picasso and fell in love with his style of art called Synthetic Cubism. 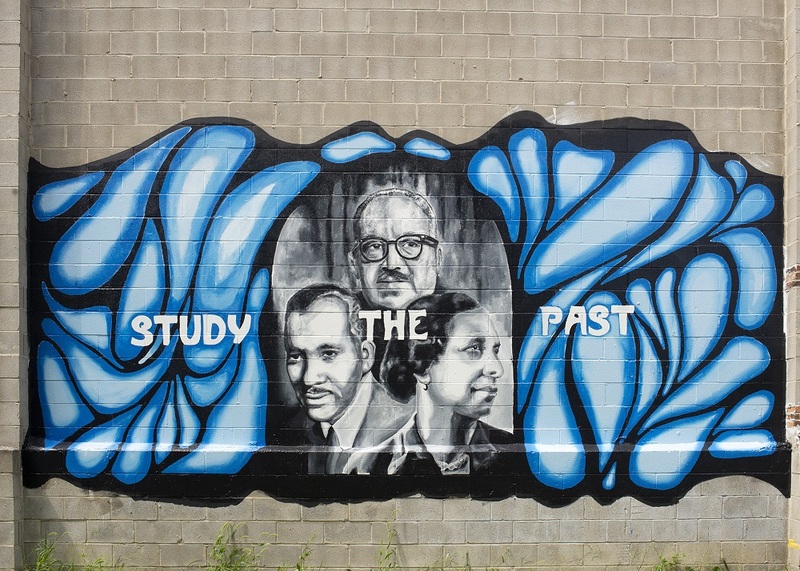 Mullen has painted murals in Baltimore City and his works have appeared in magazines, newspapers and television. Raised in Sandtown-Winchester, Herb Massie is a self-taught community-based mosaic artist and sculptor. He currently serves as the director of community engagement for Baltimore Clayworks. In 2016, Massie was awarded the Sue Hess Maryland Arts Advocate Award by the Maryland Citizens for the Arts. Iandry Randriamandroso is a muralist and a graphic and community artist. He specializes in graphic and mixed media art‐making that focuses on environmental and social subjects. He uses his artworks as educational tools to facilitate inclusive and hands‐on presentations, community arts workshops, art classes and mural projects in public and private venues around the United States. Ignacio Mariño Larrique is a Uruguayan Miami-based artist with 17 years of experience in the arts field. He likes to work with the community by creating customized holistic art works, specializing in murals and symbolism. Julie Horton was born in Zanesville, Ohio. She obtained her Master of Fine Arts degree from the Hoffberger School of Painting at the Maryland Institute College of Art (MICA) and her Bachelor of Fine Arts degree in Painting and Art Education from Ohio University. She is a visual artist, teacher, and advocate for social justice currently living and working in Baltimore, Maryland. Megan Lewis is a professional illustrator. Utilizing various mediums, she aims to create works of art that focus upon stories that reflect a critical view of social, historical and culture issues. Lewis is a freelance artist living in her hometown of Baltimore, Maryland. Born with a physical disability due to an accident at birth, Mike Thomas was born in raised in the Washington, D.C. area. He later moved to Baltimore to attend the Maryland Institute College of Art and received his Bachelor of Fine Arts degree in Art Education. After receiving his degree, he has remained in Baltimore and been a teacher, coach, mentor and working artist for the past 25 years. He is also the owner and art instructor at Artlee Studio in Baltimore, Maryland. Click here to see where each mural is located. Click here to apply for the Baltimore City Youthworks program.